home how it began music lyrics bios what can we do? 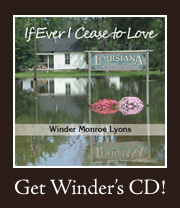 Welcome to WinderSight.com -- home of Winder Lyon's CD, "If Ever I Cease to Love" with recordings of original music and classic favorites like "Mr. Bojangles." View the short video for some information on how and why this project began and then click on the links below to see how other organizations are making a daily effort to save our Louisiana wetlands.